Expand the [...] Actions dropdown next to a workflow and select View Jobs to view a list of all jobs for that workflow only. This brings up the Workflow Jobs screen. The main purpose of this screen is record-keeping and transparency, which may also aid in troubleshooting. You can see which jobs were triggered when, see whether each job was successful or not, and drill down into each job’s details (a.k.a. Job logs). Workflow name: This is the name of the workflow that this job executed. 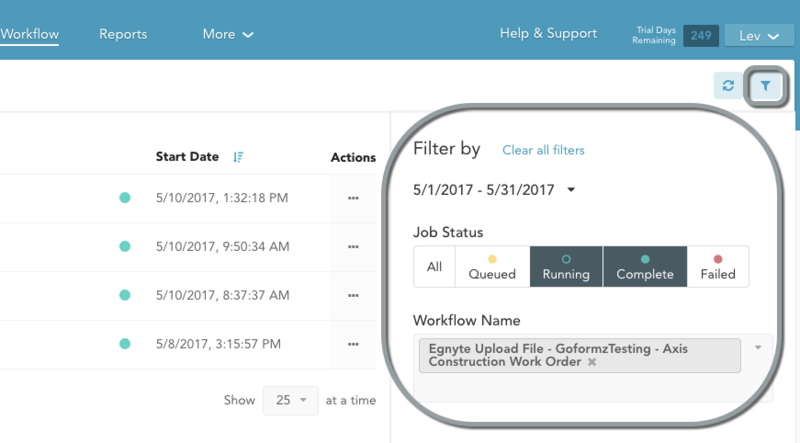 Click the workflow name to view job logs. Queued (yellow dot): The workflow trigger has occurred, triggering the job — but the workflow actions have not yet started executing. Running (green outline): The workflow trigger has occurred, and workflow actions are in progress but have not yet completed. Complete (green dot): All workflow actions have completed. Failed (red dot): The workflow trigger has occurred, but the workflow failed to execute. Start Date: The date and time when the job was triggered. Actions dropdown: Actions that can be performed on the job. From here, you can view the job log or re-run the job. To go back to the main Workflow Tab, click the All Workflows link in the top left. To open the filter menu, click the funnel-shaped Filter icon. See below for more on this. To reload the jobs list, click the Reload icon. To sort the jobs list by job start time, click the sort icon next to the Start Date column. By default, the jobs are sorted from most to least recent; clicking the icon reverses this order. To view job details, simply click the job name. See below for more on this. Time Range: Expand the Time Range dropdown to view only jobs that occurred in a given time range. The available options are Today, This Week, Last Week, This Month, and Last Month. Job Status: Click on the job status options to select/deselect them. These are multi-select boxes, so you can choose one or several job statuses, or click “All” to display all statuses. Workflow Name: Select the workflow name from the dropdown. You can select multiple workflow names. Click the X next to a selected workflow to remove the filter. The workflow list will update dynamically to match the selected filter options. 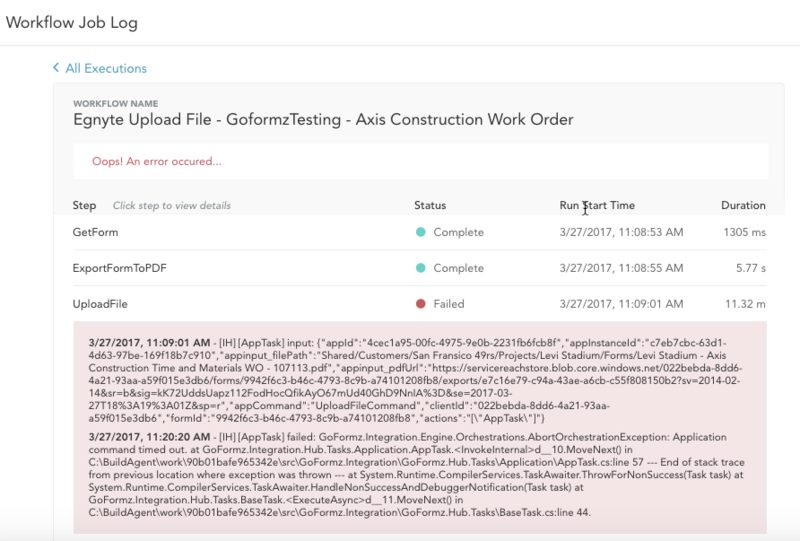 In the example above, only jobs that occurred in May 2017, have Running or Complete status, and are from the “Egnyte Upload File - GoformzTesting - Axis Construction Work Order” workflow will be displayed. To clear all filters so that all jobs are displayed, click the Clear all filters link at the top of the filter menu. To view job details, simply click on the job name, or expand the job’s Actions menu and select View Log. This will bring up the log information for the selected job. Step name: This is the same as the step’s name in the corresponding workflow. Status: The status types are the same as at the workflow level. Run Start Time: The timestamp when the step began executing. Duration: How long the step took to execute. This is very useful information for troubleshooting: you can see which steps are taking longer than you might expect, and for failed jobs you can see exactly where the failure occurred. In the example above, the first two steps executed successfully and quickly, but the UploadFile step took more than 11 minutes before finally failing. Finally, you can click on a step to view the log information for that step. In the example above, the failed UploadFile step is expanded in this way. The log information that this reveals is very technical and won’t mean very much to most users, but you can send this information to GoFormz support to help you troubleshoot the problem.